Swap spreads tend to be good leading indicators of systemic risk. 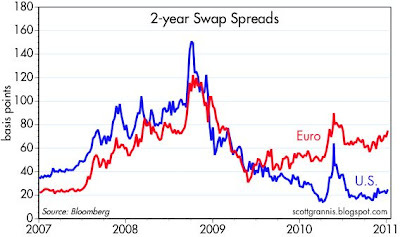 Swap spreads started rising in the second half of 2007, for example, fully one year before the 2008 financial crisis hit. So it is troubling to see that european swap spreads have been trending higher in recent months, even as U.S. swap spreads have been relatively low and flat (top chart). Swap spreads in both markets surged last May, when Greece teetered on the verge of default. US spreads settled back down, however, as it became apparent that a sovereign default, if it occurred, would be small potatoes for the huge US economy. Now Greece is back in the news, as yields on 2-yr Greek government debt have risen to a post-crisis high (second chart). 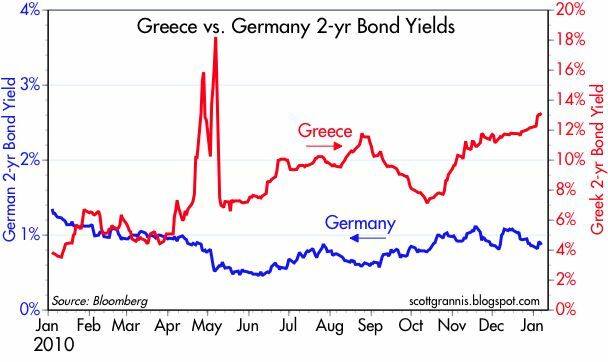 Other PIGS are in trouble as well (Portugal, Ireland, and Spain), but Greek government yields and credit default swaps tower over those of the other countries facing the risk of default. So despite the costly efforts of other Eurozone nations to bail out Greece, the market seems to be saying that a default of some magnitude is unlikely to be avoided. I would brace for that, even though I doubt it would have much of an impact on the global or the US economy. The fact that the euro is only marginally weaker against the dollar in recent months, and European stocks are near their highs, I think confirms that a Greek default won't be an earth-shattering event. With luck, markets have had enough time to price in this grim reality, so when it actually happens the impact won't be too painful. So if this does come about, what is the best approach to profit? Is there a way that that an average investor can short Greek debt? When sovereign nations welch on IUOs, it sets a very bad tone. This is not good. The citizens of Greece should be ashamed of themselves. Such a naive and myopic view. If only Greece could print as many unbacked IOU's as the US! Maybe the EURO is holding up against the greenback but is that a vote of confidence in the EURO, US, or neither? And whose next? These things are never contained. See Bernanke speech on the containment of the housing market bust. "The probability that we will go through the next two or three years with no bond-market problems, no inflation problems, is probably better than 50-50," he said. "But not much." These and weather forecasts are right about 50% of the time. As usual, I think you have this pegged pretty good. I doubt there is a portfolio manager on the planet that a Greek default/restructure would surprise. The bears will (again) say ______ is next and then ______, etc. and they may be correct. More than one periferal European country may need to resort to such but the problem is widely recognized and its nothing that has not happened before. I do expect the news when it comes to have a short term market effect but as you say the global economy won't be affected much. It appears to me that the central banks are clearly determined that the seesaw will tilt toward inflation. How the states' finances play out will be fascinating to watch. Many are quickly getting the fiscal religion so perhaps most can muddle through. If there is a fairly robust economic recovery over the next few years austerity coupled with rising tax receipts might keep the wolf from the door. The US economy, even as maligned as it is, should be preferable to Greece or Portugal's. China inflation will kill the global hope rally.. I do not think it is myopic or naive to hold the position that a nation-state welching on its legal, contractual obligations in bond markets is a bad idea. Greek citizens could solve their problems just by developing a good tax code, and cutting outlays. Instead, they are set to say FU to bondholders who actually believed that sovereign debt was supposed to be as close to sacred as we have in a secular world. Yes, we print dollars. It gives us an option other do not have. If we did not have that option, I would expect to cut outlays to balance the budget. Hell, I want to do that anyway. Moral hazard? Now, explain to me why I should pay back my debts. AIG, Greece, GM etc etc etc., they don't pay back their debts. I think you are severely misunderstanding the Euro crisis. Your indicators only show that markets think the EU can contain the damage of a default at Greece's borders, but need I remind you that even though the Housing bubble popped in 2006, it was not until 2008 that markets understood the extent of the damage. I don't know whether markets are right or not, but this is not the type of situation that markets are very good at pricing (as recent history has shown), so I am not sure looking at those indicators is very useful. Whether you are right will be entirely determined by the POLITICS and not the ECONOMICS on the situation, so any post on the subject that does mention a recent Merkel comment or speculate on the upcoming Irish election is pretty much useless.